I grew up in the south and maybe that is the reason why I can’t be away from the sea for so long. 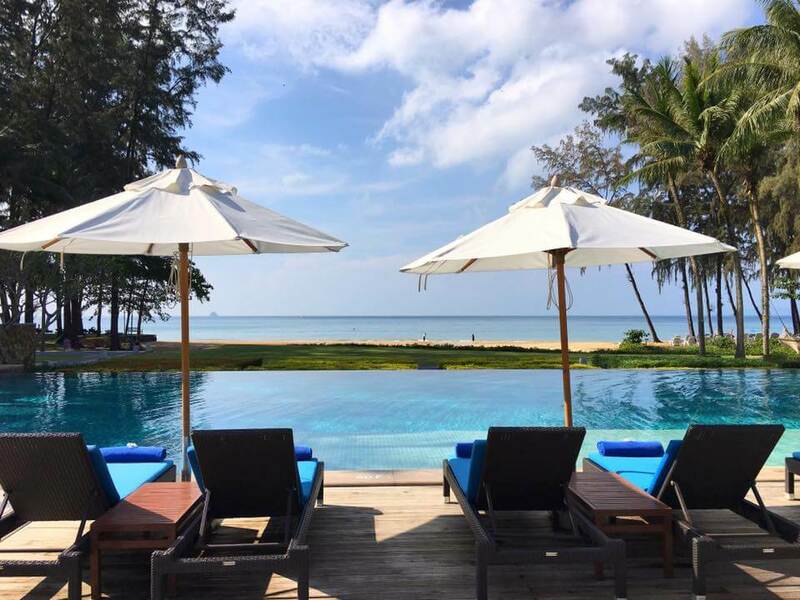 I often go to Koh Samed and Hua Hin for a long weekend because it is close to Bangkok, but my favourite beach destination is Southern Thailand. There are many islands with white sandy beaches and crystal clear water such as Koh Tao and Koh Lipe. 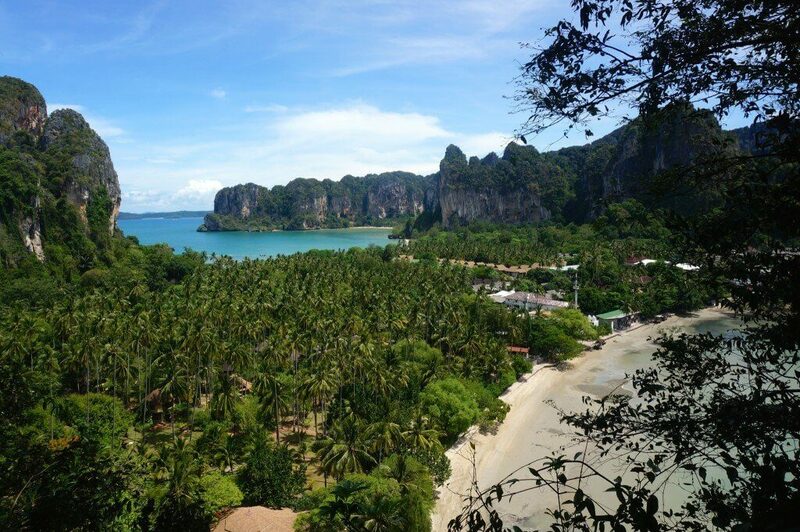 For this trip my family and I wanted to stay on the mainland so we chose “Krabi”. Although we have been to this province many times, but something special about this place makes us keep going back. Ao Nang beach is Krabi’s vibrant tourist centre. It is the hub from which to plan your trip to sea as well as to nearby islands. You can find all types of accommodations, shopping and services here. I stayed on this beach in January 2014 and I did have a lot fun although it was busy. However no accommodation in Ao Nang (with the exception of one, Krabi Resort) has direct access to the beach. 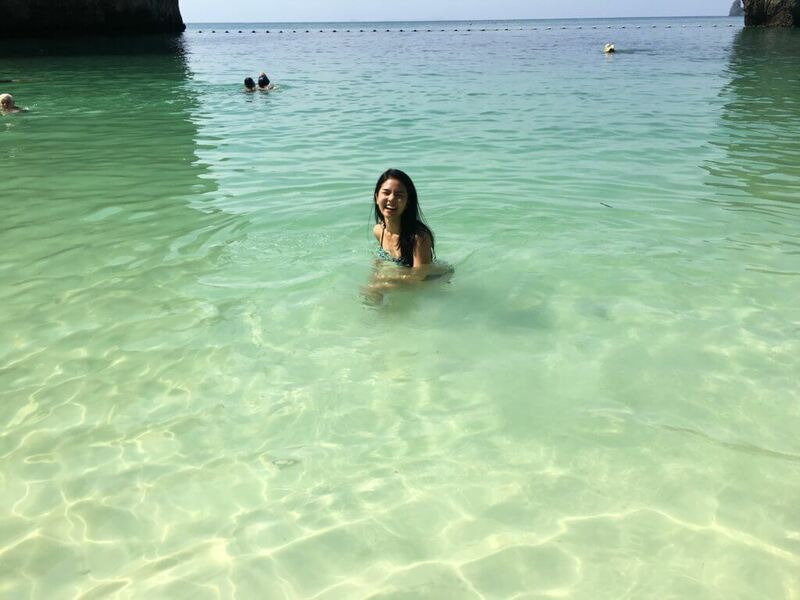 If the prime concern of your holiday is comfort and choice, you can do no better than the various pleasures of Ao Nang beach. 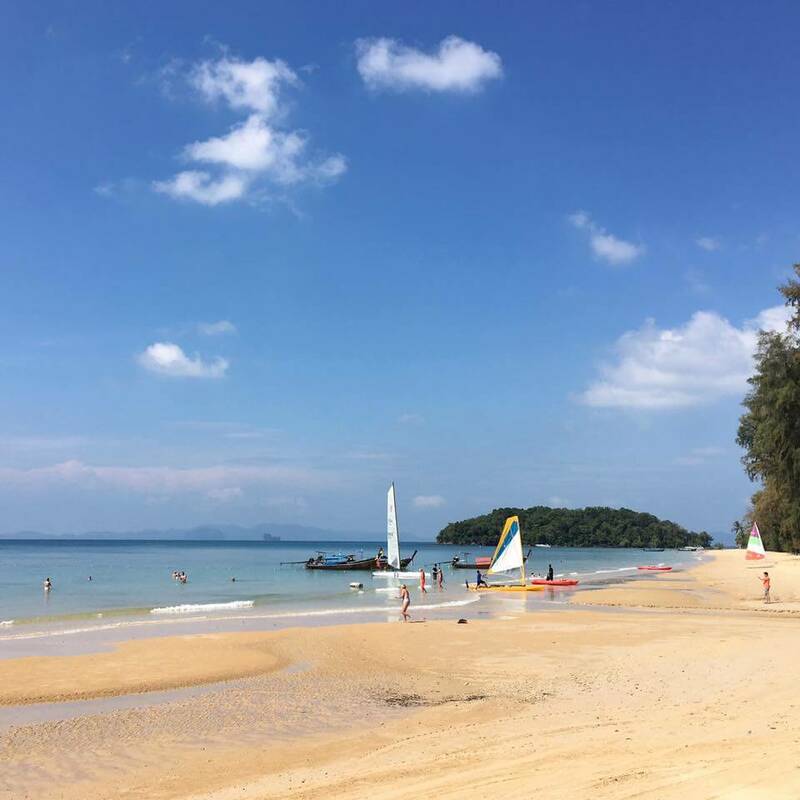 Nopparat Thara beach is located 18km west of Krabi Town and adjacent to Ao Nang, yet it is still underdeveloped with a few resorts and restaurants. This area generally takes care of the overspill of tourists and is fast becoming a tourist spot in itself. Klong Muang beach is 20 km away from Ao Nang. This beach is the place to be if you would like to have hassle free holiday. 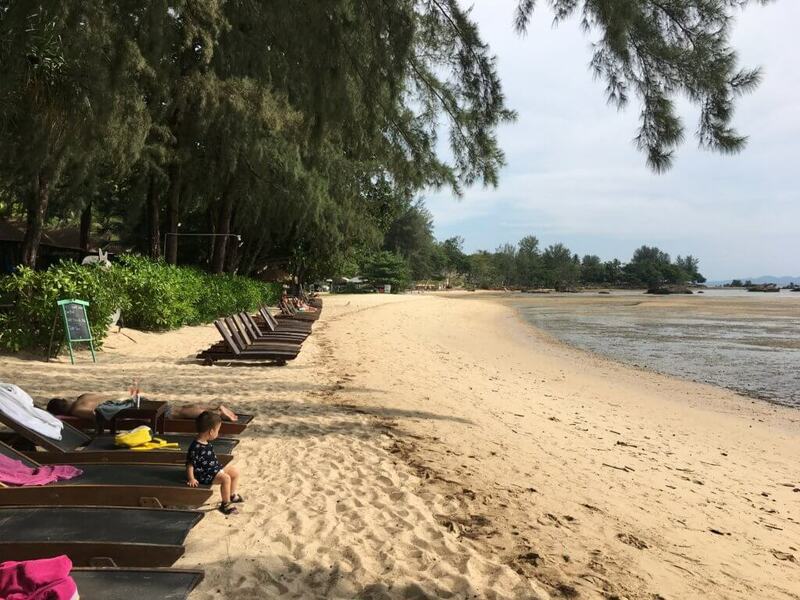 I stayed on this beach in December 2016 in Dusit Thani Krabi Beach Resort, and it was absolutely wonderful. The beach is clean and calm. I was relaxed the entire time I was there. A beautiful day in Klong Muang beach. Tubkaek beach is next to Klong Muang. I stayed on this beach on my latest trip to Krabi in April 2018. Here is another perfect place to rewind. 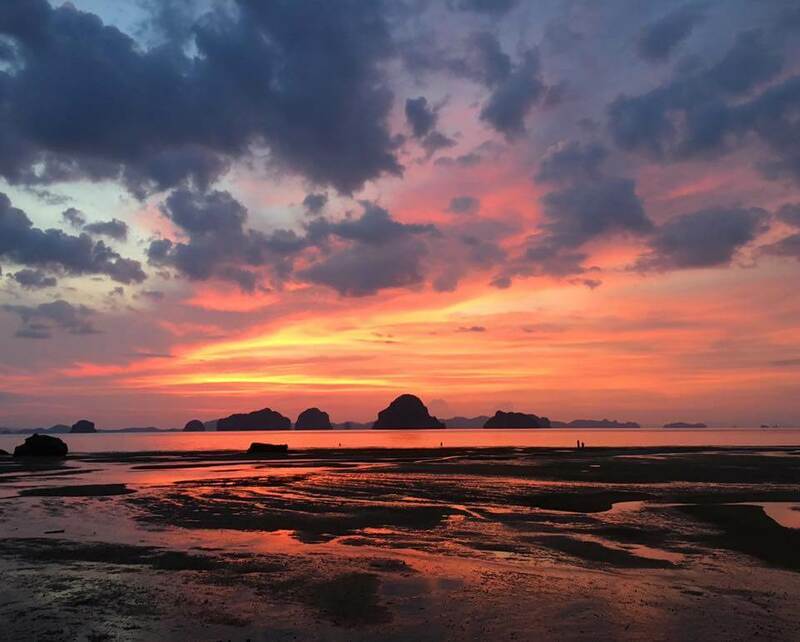 I love the breathtaking views over Koh Hong archipelago, and the amazing sunset!! Tip: There is only one restaurant in Tubkaek beach and no convenient store in a walking distance (the nearest 7Eleven is in Klong Muang which is 10 minutes drive), so you might want to prepare some of your favourite snack or beach essentials on the way in. Hotels on Klong Muang and Tubkaek have direct access to the beach, unlike the hotels in Ao Nang. The premises offer spas, pools, restaurants and even shops within the grounds, there is no need for guests ever to leave the confines of the resort area. Koh Lanta beaches This island offers a wide selection of resorts for all pockets. All the beaches in Ko Lanta are on the west coast so it is perfect for watching the sunset. I stayed on Lanta island once some years ago. Despite all the development, the long and wide sandy beaches manage to remain semi-deserted, even in high season. This gives the whole island a wonderfully laidback atmosphere, where you can read all day in your sun lounger completely undisturbed. 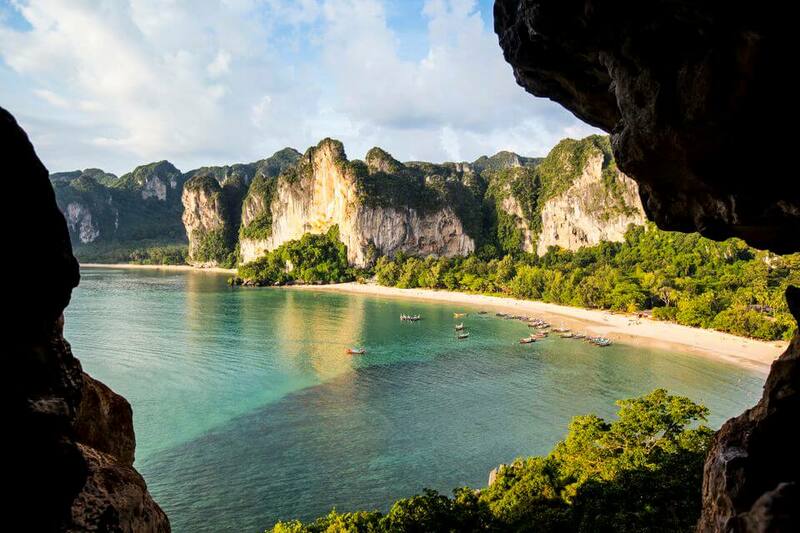 Railay and Tonsai beaches are known all over the world for their famous climbing routes. They can only be accessed by boat (a 15-minute ride from Ao Nang) , this gives Railay an island vibe and also ensures there are no cars on this isolated peninsula. Railay has two sides, east and west. West Railay Beach and Phra Nang Beach seemingly materialises out of a postcard, surreal with its iconic backdrop of towering limestone cliffs and sandy beaches washed with clear emerald waters. The beach does get crowded though as it is a popular tourist site. 1. Island Hopping and snorkelling You can hire a private longtail boat or buy a tour package and join a speedboat for half day or full day. 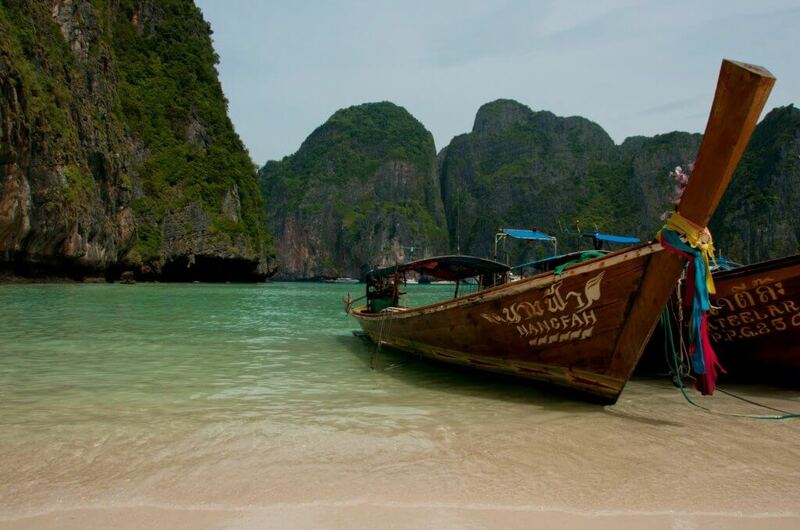 The popular islands to visit are beautiful Phi Phi islands which is home to Maya Bay, Poda Island, Hong Island Lagoon. Maya Bay, the famous filming location for the movie “The Beach”. 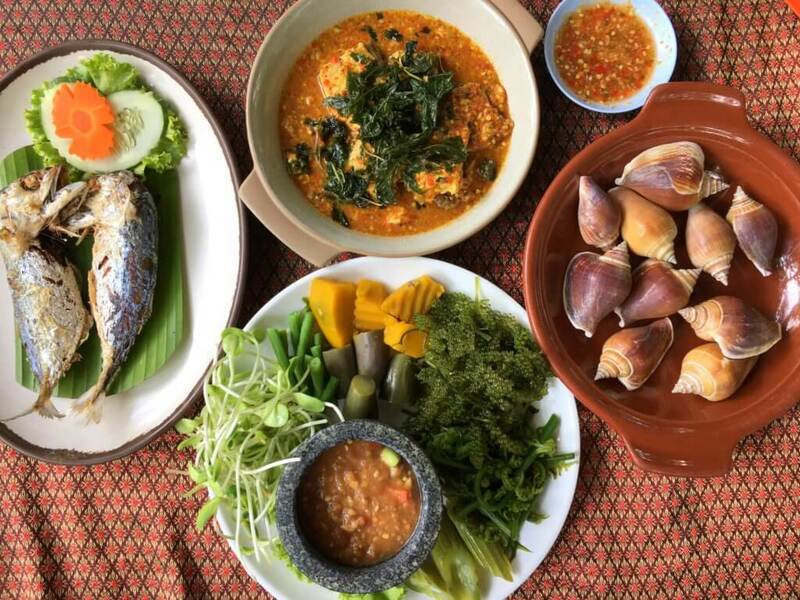 When in Krabi, you must try their signature dish “หอยชักตีน Hoi Chuk Teen or Wing shells or Dog Conch” (the dish on the right in the picture). We had many good meals, but our favourite restaurant is Ruean Thip (เรือนทิพย์) near Klong Son temple that serves the biggest Wing shells with very tasty seafood dip. ชักตีน Chak teen means ‘feet pulling’ and hoi means ‘shell’. To prepare the dog conch, the shell is soaked in salty water for about 30 minutes. The dog conch then begins expelling the mud from inside by pushing its feet out. It is rinsed several times and then boiled gently, starting with cold water. This way, the dog conch pushes its feet out, so when cooked, they can be easily picked out with a toothpick. 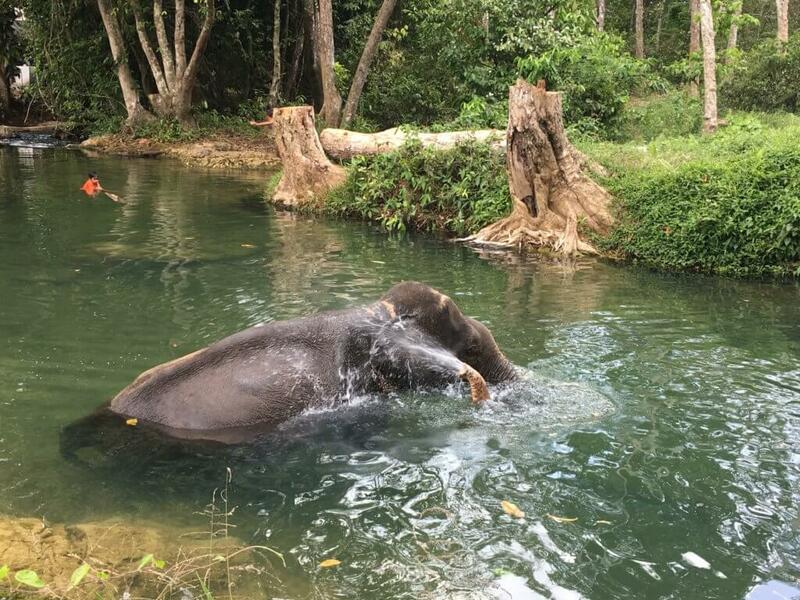 My sister wanted to visit an elephant camp and there we witnessed a baby elephant talking a bath. It was enjoyable to watch. 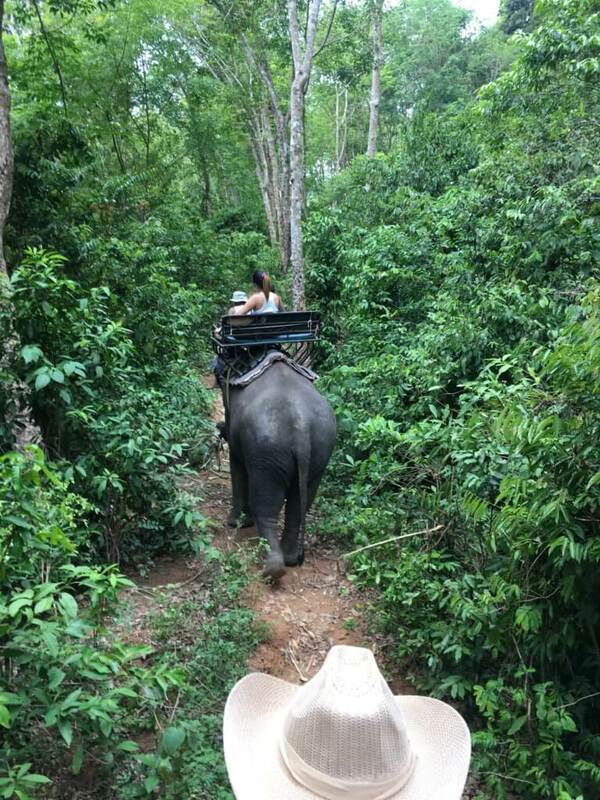 Elephant riding in rubber tree forest (30 minutes for 600 Baht). I don’t like to pack a lot of things to do in one trip. So those were all activities my family and I did together on our holiday, the rest of the time we were just relaxing on the beach and enjoying Southern food. 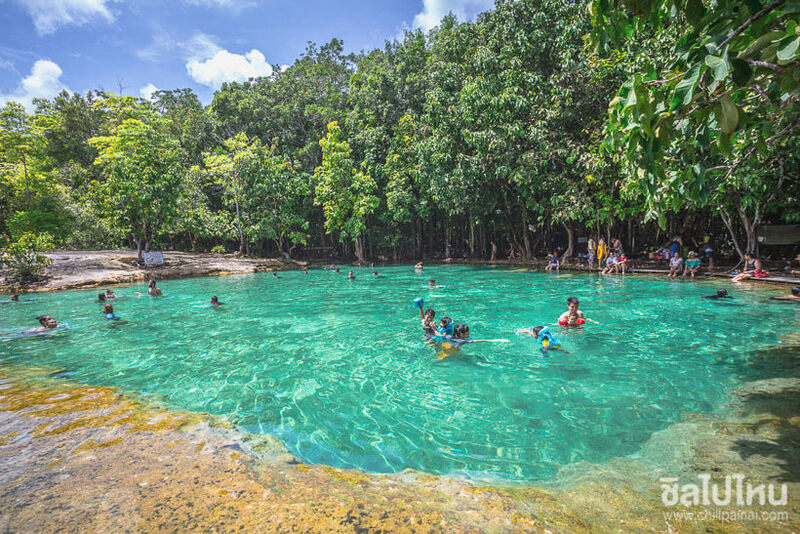 There are many more interesting places to visit in Krabi such as Emerald pool and Hot spring where I visited before when I was a kid. 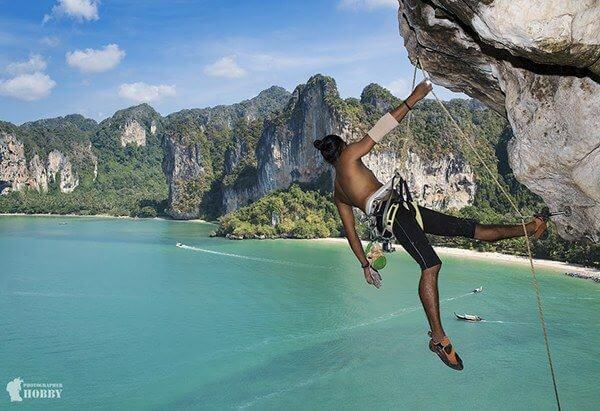 If you are up for some adventurous activities you should try rock climbing in Railay beach. You get to see a lovely view when you climb up to the top. I have been wanting to do this, but I haven’t had a good opportunity to do it yet. It is in my to-do list for my trip to Krabi in the future. You can also try sea kayaking which is a great way to explore the coastline and its many karst formations. The Andaman Sea is shallow for long distances off the shore and the water is calm. Therefore making conditions ideal for sea kayaking. Kayak from Ao Nang to the Railay peninsula, explore the offshore karst formations near the resorts of north Krabi, or go further afield with an tour guide into the mangroves that line the coastline. There are two seasons, dry and rainy, defined by the reversal of the monsoon winds. 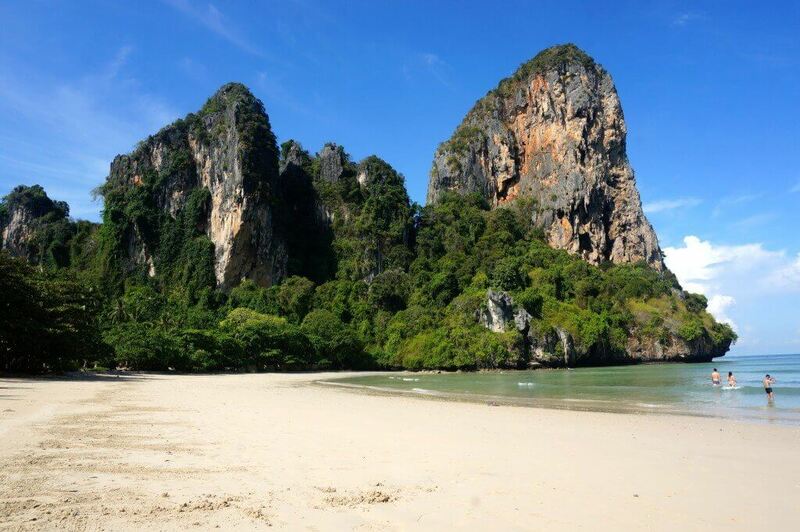 The ideal time to visit Krabi is in late January to April, when you are sure to enjoy nearly perfect conditions: calm seas and clear blue skies; moderate temperatures. By coming at this time, you also avoid the peak season supplements the hotels charge around Christmas and New Year. However I recommend you to avoid traveling during Thai New Year (12th-16th April) as it gets extremely crowded everywhere. From Bangkok, a great way to save cost is to hop on a budget flight that will take you to Krabi in about one hour. There are Air Asia, Nok Air and Lion Air that offer direct flight at low cost. Boat trips: Go at a different time than most others. Either very early by taking the very first boat or booked a sunset trip. I hired a private longtail boat that departed at 8.30 a.m to go to Hong islands and when I arrived at 9 a.m. the island was still quiet, I stayed there until 10:30 and by then other tourists started to flock to the beach. 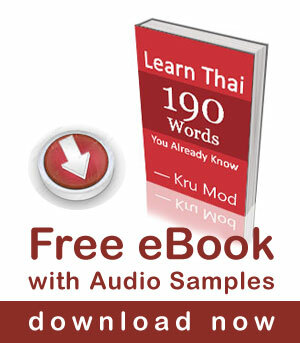 Learn some Thai phrases: The main language in Krabi is Thai. Most locals that deal with tourists are able to speak some English, but learning a few phrases of Thai will go a long way. Watch our 12 Basic Thai Lessons for Tourists. Krabi is NOT an island, though there are plenty of islands in Krabi. The province is largely on the mainland, but there are also some 132 islands offshore that fall under its jurisdiction, several of which – including the Lanta Islands, Ko Phi Phi Don and Ko Jum – are inhabited. Thank you very much for all your articles. You have provided stunning information which is so clear and precise. Personalizing it makes us feel that we are there. I have visited BKK twice. My first visit was in November 2017 when I spent a week in Koh Chang and visited Chiang Mai for two days. The rest of my two weeks was in BKK. My second visit was in April 2018. I had planned to spend Songkran there but due to an emergency I had to rush back in 4 days so missed it. I plan to be there in April 2019. I plan on visiting Songkla in the south for a very special occasion so I will plan a trip to Krabi (since I have been inspired by your article). Thank you Kru Mod. I love your videos. I will get in touch with you on my next visit (for sure). Sawasdee krap Kru Mod. I will be sending you an email in a day or two. I am very interested in learning Thai not only to speak but also to read and write. I’m finding the script a little overwhelming to learn to read and write. Khop Khun Krap for your videos. I look forward to your latest. Do take a look at my website. Sawatdee ka Khun Winston. Thank you for your message. We are happy to help you learn Thai. We offer a free trial lesson for students so they can find out how we can work best together. Please write us at adjima_t@hotmail.com to discuss to find suitable time both ways.